You know how sometimes you need to take a break from work and fold an elephant? 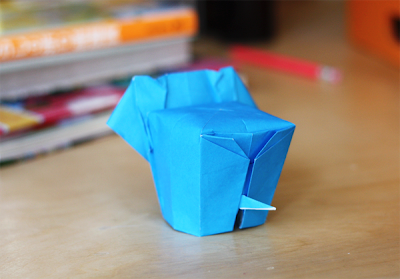 Here's my attempt, following this YouTube video in which Jo Nakashima shows how to make an origami elephant designed by Li Jun. This guy's pudgy derriere is even cuter than his face. P.S. Did you know that for those verification 'pictures' you can type any word you want and it still works? You mean when you leave a comment on here? Yeah, or on any blog that has the verification words. There's one word and one picture. Wow ... yours looks even better than the video! So cute! I love this. I really like origami and this is perfect. He's just so cute! I'll have to bring out our origami papers! Wow! That's really cool post. I want to try some too. I'll have to practice this one. My 4 year old daughter is constantly asking me to make her origami flowers and boxes. AND she LOVES elephants!! Aw, I want to make this. definitely making this cute elephant! My daughter, the 10 year old origami addict, will love this one. She's on a crane binge right now - I think the plan is to attach 100 of them to her ceiling - so the elephant will be a welcome change for her. I love your blog and all what you do! I love it! And i really know that feeling. Tomorrow I'm going to fold a elephant, thank you for sharing! His bum IS cute. It's that little tail. 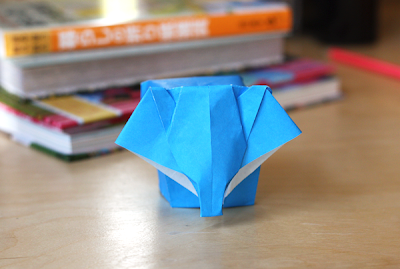 Never done origami before but this elephant was too cute to pass up. So I got out my paper and sat infront of the computer watching Youtube and made my slightly wonky elephant :) Good fun!! Well done. I can not follow that video past the 15 minute mark.